Home » Daily Report » action » Mar. 29 (Fri): Construction at 3 Locations Simultaneously in Progress, Shipping from Shiokawa District of Motobu Town Starts on April 1? In a drizzle, 25 people resumed the sit-in from8:30am. 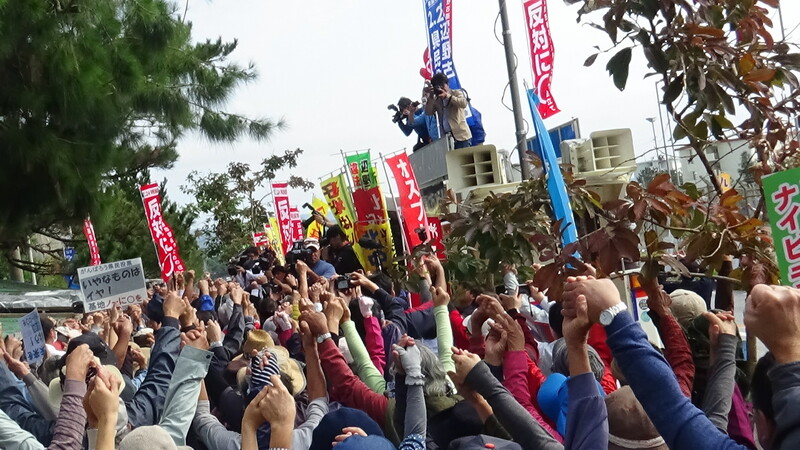 In the afternoon, 40 people rallied in front of the Gate, and appealed to each truck holding up placards. Three times a day from the morning through the afternoon, 226 truckloads in total were delivered today. Two boats and 5 canoes went out on the sea to protest but met by a barricade of several tens of rubber boats of the Coast Guards. The status of construction is difficult to see from the water. But judging from the number of dump trucks going to and fro, it is obvious that the work is progressing rapidly. The picture taken from the air shows the status of construction. The upper picture shows the zone 2 where the depositing work started 3 days ago. The lower picture shows the zone 2-1 where the depositing started in December, 2018. 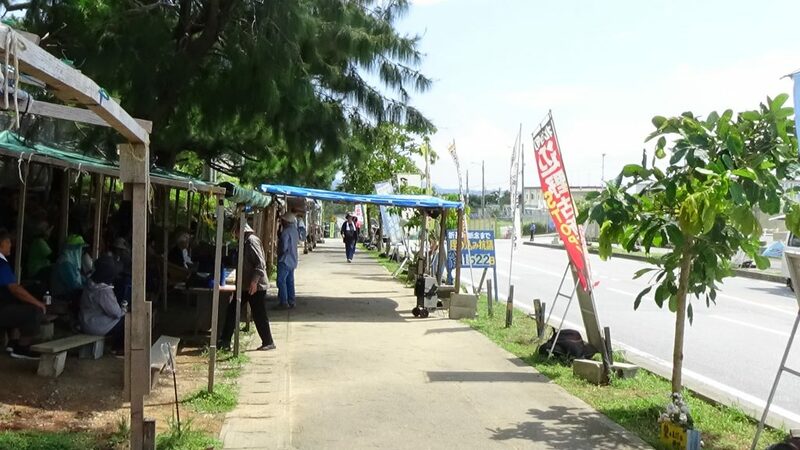 Since the repair work on the pier in Shiokawa District of Motobu Town had been completed, Okinawa Defense Bureau requested a permit to use the pier. 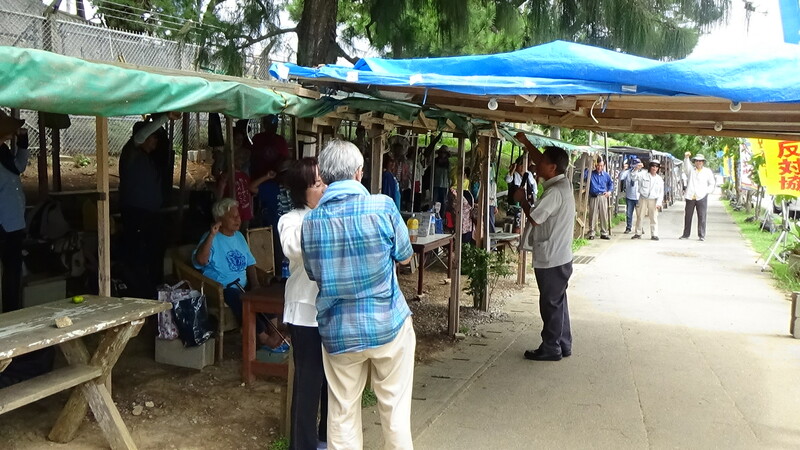 The Motobu Town mayor Taira issued the permit to allow the use of the pier in the close of business on Mar. 29th, noting that “the town does not have a power to dispute with the central government. It is beyond our capacity”. It has been reported that the Defense Bureau will start shipping earth and sand from the pier in Shiokawa District. With continued use of Ryukyu Cement Pier in Awa, shipping of earth and sand to Henoko will be accelerated. The truckloads of 224 were delivered today. The picture shows the Pier in Awa on the day before yesterday. Due to “Wednesday Intensive Action”, the number of dump trucks making deliveries was reduced. The dump trucks could not easily come out of the gate and were forced to stay by the Pier, which delayed loading to the carrier ships. Effect of Wednesday Intensive Action!